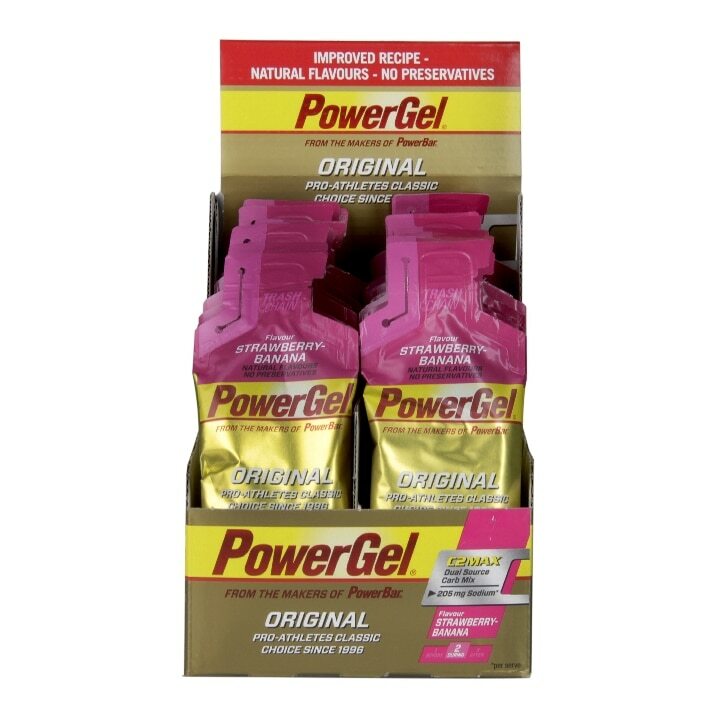 Powerbar Gel Fuel Strawberry & Banana is rated 4.0 out of 5 by 6. Rated 4 out of 5 by janjua from Well recommended! A great product which can help sustain you during/throughout a workout! Rated 5 out of 5 by AndrewSwansea from Easy to digest I take part in triathlons and endurance cycle events (8 hours +) I've tried a few other gels but stick with these and in particular this flavour (Strawberry&Bananna) as I find the gel very easy to digest. As with all gels you'll need to take a mouthful of water or two after it, as this helps wash down and makes gives your mouth a rinse. The consistency of the gel is just right, I have used others that just repeat on me and have been awful. A previous reviewer has mentioned they're hard to open, thats now not the case as the packaging has been redesigned and I find very easy to open and digest whilst riding my bike mid race. Rated 4 out of 5 by ukfms from Loved the taste and the energy boost Tend to use it when running more than 10k to give an energy boost. Never run a marathon but used these on the last half marathon I did and I thought they were great. Have tried some other similar products, with all sorts of flavours, but this is by far my favourite, strawberry/banana. Definitely recommend it! No problem opening or consuming as per other reviews. Rated 2 out of 5 by Twinkle77 from Taste & consistency vile, opening the sachet hard! took this out to trial these gels on my 18 mile run in preparation for a marathon.. I had used other gels in the past but they were problematic with my tum. I liked that this sachet was more compact and had high hopes. First problem trying to get the sachet to open. You know, you tear on the perforated part and it glides open..... or not. You spend ages trying to open with your hands, which if you're exercising are generally warm maybe clammy. Then, when the hands fail, you try to use the teeth. After what seems like an eternity you get it to open - well, half of it - so you squeeze the contents of the gel out of a hole the size of a needles. Then the flavour. Really terrible. Wouldn't bother here. I now just take a carton of apple juice. At least you can get the packet open even if its bulky to carry!